ANNE CONSTABLE reports for The New Mexican. 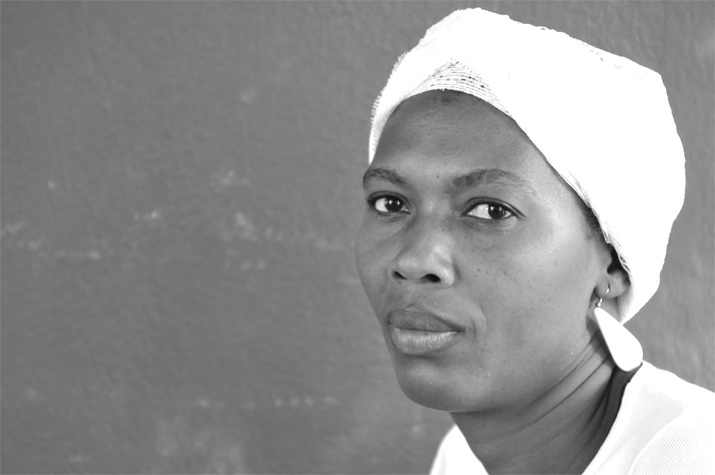 Mireille Delisme’s hometown of Leogane was at the epicenter of the massive earthquake that rocked Haiti in January 2010. As much as 90 percent of the buildings were damaged, and many colonial-era buildings collapsed. Delisme said Tuesday that her sister and an aunt were among as many as 30,000 people who died in the seaside town about 18 miles west of Port-au-Prince. She subsequently created Catastrophe du 12 Janvier, a vodou flag depicting in sequins and beads the crumpled buildings and the bodies of the dead, which include a pregnant woman and a baby. The piece is part of a new exhibit at the Museum of International Folk Art titled “The Arts of Survival: Folk Expression in the Face of Natural Disaster.” It is the second annual exhibition in the museum’s Gallery of Conscience. For the first time, Delisme will be selling her richly detailed vodou flags, or drapo, from her booth at the Santa Fe International Folk Art Market. She said she shipped about 160 flags and carried more in her suitcase in preparation for this weekend’s event. Delisme is one of 70 artists participating in the market for the first time. The market features more than 150 artists. Delisme said she learned beading from her cousin, Yolande Ceauston, who worked in a factory in Port-au-Prince sewing beads and sequins onto expensive bridal gowns for the U.S. market. In 1986, when there was an opening at the factory, Delisme went to work there, too. In 1990, the factory closed because of political and economic issues, and Delisme, 25, wasn’t sure what she would do to support herself. It was around that time that she had a dream that determined her future. She related the dream to her father, a vodou priest, who interpreted it. He told her that the design in the dream was the symbol for the vodou spirit — or Iwa — named Erzulie, the spirit of love represented in vodou tradition by a heart. Recognizing that this might be a way of supporting herself, Delisme began making more flags with vodou symbols given to her by her father. “He had all kinds of designs, and they were my references,” she said. The vodou flags she has brought to the market include representations of various spirits such as Agwe, who protects sailors and is usually represented as an admiral or a ship’s captain; Simbi, a freshwater divinity associated with healing and leaves, who is depicted as a mermaid; and Legba, a guardian of gates and doorways. 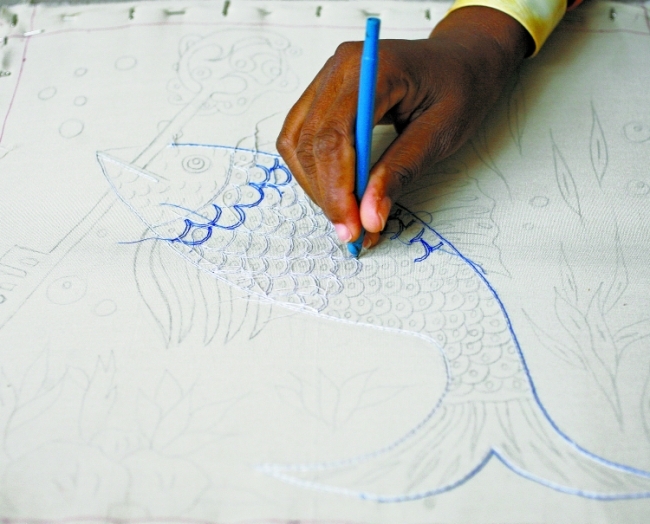 The ritual flags are the most celebrated genre of vodou’s secret arts. Each society has its own drapo displayed in the ounfò, or temple. The flags are carried when members take to the streets in the spring for music and dancing. Delisme said her brother, also a vodou priest, uses her sequined flags in rituals and ceremonies and, since her father died, has helped her interpret her dreams. According to Patrick Arthur Polk in Haitian Vodou Flags, the spiritual realms reflected in the flags are not dark, frightening places of black magic and superstition. “Drapo exemplify the beauty, elegance and enduring embrace of gods and ancestors in all their manifestations,” he wrote. In 2010, Delisme was an artist in residence at the Smithsonian Institution’s Folklife Festival Marketplace. Diana Baird N’Diaye — folklife curator and cultural-heritage specialist at the Smithsonian, and a member of the selection committee for the Santa Fe International Folk Art Market — championed her for this year’s market. Delisme’s travel expenses are being paid through a grant from The Hand/Eye Fund.